*2-year warranty applies to all Amica and Wellco branded products. If you’re looking for amazing value home appliances, look no further than Dalbeattie Appliance Centre! We offer low prices on a range of quality washing machines, fridges, freezers and cookers for immediate delivery throughout the Stewartry. And, all our Amica home appliances come with a 2-year warranty! At Dalbeattie Appliance Centre, you’ll also find small appliances including kettles, microwaves and toasters along with a full range of spares and accessories for vacuum cleaners, washing machines and tumble dryers, including vacuum bags, filters and hoses. Dalbeattie Appliance Centre repairs all makes of washing machine, tumble dryers and vacuum cleaners as well as electric cookers. We are the leading Dyson repair specialists in Dumfries and Galloway. As Members of the Whitegoods Trade Association and a D&G Council Trusted Trader, you can buy from the Dalbeattie Appliance Centre with total confidence. We’re also Members of the Federation of Small Businesses and the Dalbeattie Chamber of Trade and Commerce. Drop in and see us today or call us on 01556 288613. We’re located adjacent to the car park in Alpine Street, Dalbeattie. We’re open Monday, Wednesday, Thursday and Friday from 9am to 11am and 3pm to 5pm and on Saturdays from 10am to 1pm. We deliver to the following postcode areas: DG5, DG6 and DG7. Robert Kirk of the Dalbeattie Appliance Centre. 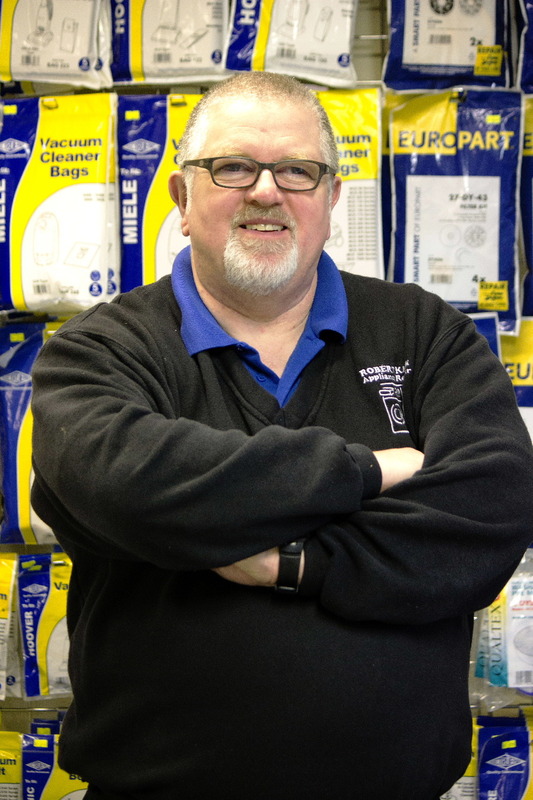 “We offer great service and genuinely care about our customers, so you know that we will always strive to offer you great products, great service at the best possible value-for-money prices. We offer amazing value on all our new appliances such as washing machines, tumble dryers and vacuum cleaners. Any pre-owned appliances we get in from time to time have been fully reconditioned, meticulously serviced and checked before being offered for sale. All our machines come with a warranty so you can buy with total confidence. And in the unlikely event of anything going wrong, we're right here. No spending hours trying to get through to call centres, no premium rate phone numbers, just good, honest old-fashioned service on your doorstep! What's more, we're members of the White Goods Trade Association and are a Dumfries & Galloway Council Trusted Trader. Customer satisfaction is our top priority, always. That’s my pledge to you!"